Change Management Process Or Steps - What Is Change Management? Change management is about properly implementing the changes in the project. When I was working as a developer a long time ago, I know how much rework I had to do to implement the change in the project. Project managers spend lot of time and effort in developing the project management plan and other artifacts in the project. So when change occurs in the project, it is usual the project team shows resistance or is not comfortable with implementing the change. Change is inevitable. But Is change good or bad? A change is about transition from the current (AS-IS) state to a TO-BE state, with an acceptance of all the relevant stakeholders in the project. And changes can appear at any point of time during the life cycle of the project. So project team and the project manager should understand the importance of the change when handling it. After the point, change management is not to prevent the changes, but to handle it in a better way, so that project and organization that is sponsoring the project get the most benefit out of it. There is a proverb that says, “The only thing that never change is the change itself”. Let us first understand what the change is and several terminology related to the change management. In this blog post we would cover the following topics. A Change is the modification to any Plan, project document, or baseline. A change request is a formal proposal, documenting all the necessary information pertaining to the change to send it to change control board for further processing. What is Change Management In Project Management? 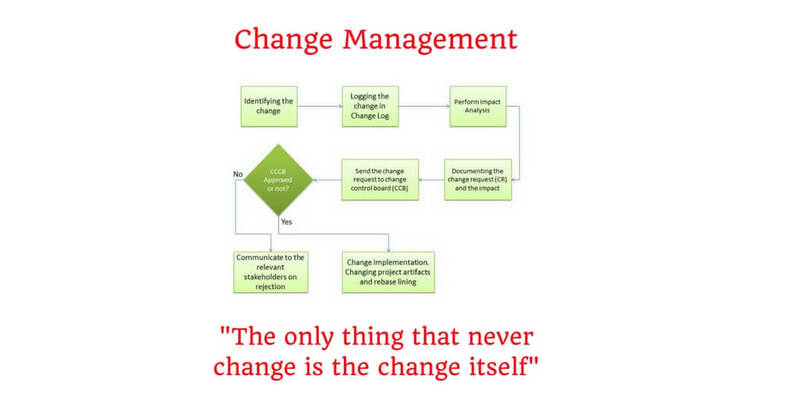 Change management is the whole process starts from identifying the change, perform impact analysis of the change to the project, documenting the change request to send it to change control board for further processing and finally implementing it if the change control board (CCB) approves the change. If CCB does not approve the change, then that justification would be documented and would be informed to relevant stakeholders. Every change that is identified in the project has to be logged into the change log, irrespective of whether this will be approved or rejected by the change control board (CCB). Actually logging the change happens much before sending the change request (CR) to CCB. In fact change needs to be logged into the change log, immediately after identifying the change in the project. Eventually change control board (CCB) is group of people usually including the sponsor, who are responsible for reviewing the change request and take decision whether to approve or reject the change. Changes can be caused by preventive actions, corrective actions or by a defect repair. Another most popular cause of change is because of a new requirement adding in the scope. Sometimes preventive actions comes as change requests so as to prevent issues in the project that may occur later. On the other hand corrective actions comes as change requests to correct the project from non-compliance and non-conformity. Defect repairs may also require changes to the project baselines, documents and code base. Hence defect repairs are also another reason for the change. Finally a new requirement or scope change would require changes in other constraints. Meaning the scope changes, may cause modifications in the artifacts related to other constraints. There are many organizations, which are realizing the needed changes in the way they are doing business and transforming quickly. Majority of the ICT companies are going though the journey of digital transformation tracks these days to align to the growing digital needs of their consumers. Another similar and good example could be Y2K problem in the late 1990 s. Lot of organizations went through changes to address the Y2K issue. As we discussed earlier, changes are caused by preventive actions, corrective actions, defect repairs or new requirements. Changes can be identified or raised by any stakeholder in the project or sometimes the changes may come from outside of the project. Irrespective of whether the change is big, small or silly, the change needs to be enter in the change log. So change log should contain all the changes in the project. Analyze the impact of this change on the project. This includes the impact on the all project constraints such as scope, time, cost, risk, resources and quality of the project. Document all the information related to change request specification and also the impact to all the project constraints that has obtained from the impact analysis as part of the previous step. Send the documented to change and its impact to the change control board (CCB) for review. CCB needs to review the change request, and its impact on the project and project constraints. Based on the impact and any other parameters, CCB either approves or rejects the change. If change control board (CCB) rejects the change for any reason, then you need to inform relevant stakeholders on the status and the reason for rejection. Once CCB (Change control board) approves the change request, you would take it further to implement the change in the project and modify appropriate baselines. Perform Integrated change control process belongs to project integration management knowledge area. For a detailed understand on perform integrated change control, please read through the blog post on the complete guide to project integration management knowledge area. Eventually perform integrated change control is the process which deals with change management as mentioned above in change management life cycle. That is sending the change request and the impacts to CCB and CCB taking the final decision or approving or rejecting the change. To conclude with changes occur naturally as the project progress. As a project manager you responsibility is not to prevent the change. Instead you need to take change in a positive way and perform the change management function in a proper way as mentioned above.